I was asked to put together a banner for someone who bought the kit but did not know how to sew. 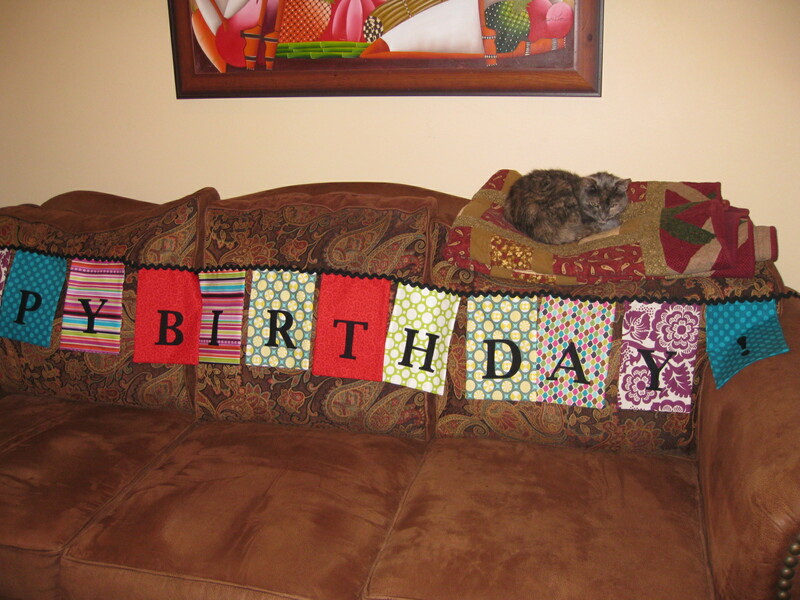 This banner is easy to make! You will need assorted [coordinating might work best!] fabrics for each rectangle, a backing fabric, black fabric for the letters, and black ric-rac. Just cut the 8.5" x 10.5" rectangles for each letter out of the front and backing fabrics, then sew three rectangle sides together (right sides facing), leaving the short top end open. Press it, flip it inside out, and press again. In the meantime, trace letters onto Heatn' Bond paper (be sure to trace them backwards, so they will face the correct direction once cut out of fabric! ), iron them onto the back of the black fabric, and cut them. Iron letters onto each rectangle. Finish the top of the rectangles by turning in about 1/4 inch of fabric and pinning them onto the ric-rac (ric-rac on top). Sew rectangles to ric-rac using black thread, and, Done! Make similar banners using appropriate colors for Valentine's, Easter, Fourth of July, you get the idea!